One of the UK’s smallest seabirds, weighing only 40-60g - no more than a tennis ball. Adults have a black cap and a distinctive white forehead. Its bill is yellow with a black tip. Terns (Sternidae): including the little tern there are five species of terns breeding in the British Isles. The others are common tern, roseate tern, Arctic tern and Sandwich tern. Little terns return to the UK in April to breed. Courtship starts with an aerial display involving the male calling and carrying fish to attract a mate. A female will chase him up high before he descends and on the beach she may accept the fish offered. Once an offering has been accepted they will then mate. Their nests are shallow scrapes on sand or shingle beaches, spits or inshore islets where they normally lay 2-3 eggs. This takes place just offshore in shallow water along sheltered coasts with a diet of fish, crustacean and invertebrates. They can be seen plunge-diving for fish along the shoreline. 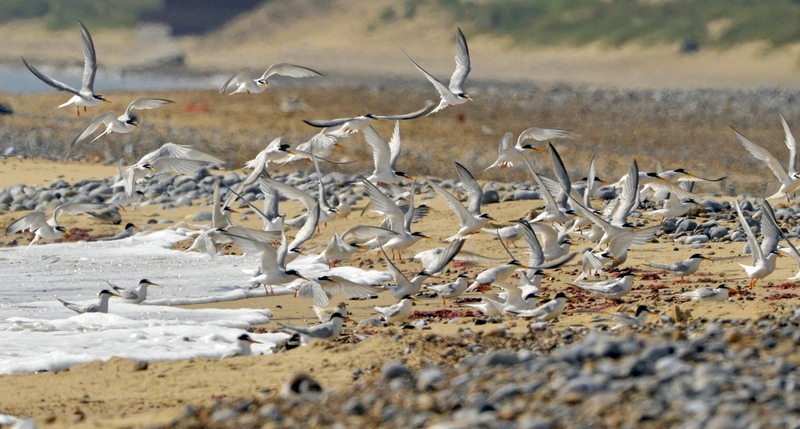 Feeding close to the shore is a foraging behaviour not seen in other seabirds which may fly long distances for food. This means little terns are vulnerable to disturbance where they feed and a lack of prey food close to their breeding colony. Little terns winter in West Africa and migrate thousands of miles to nest on our beaches during April to August. A little tern breeding in 2018 in North Wales was found to be 25 years old. It will have travelled at least 200,000 miles in its lifetime. in the UK, little terns nest exclusively on the coast in well-camouflaged shallow scrapes on sand and shingle beaches, spits or inshore islets. found around the UK coastline at suitable breeding beaches. The largest colonies can be found along the east coast of England and North Wales. They occur along European beaches and globally have several sub species. Other closely related species are the least tern in North America and the fairy tern in New Zealand. Between 1985 and 2000 there has been a long-term decline in the UK with little tern numbers down by 38%. More recently between 2000 and 2015 the trend is -18%. There are three main reasons for this. Rising seas and coastal flooding pose a problem for little terns, unusual summer weather events and high spring tides causing flooding can flood nests and wash away chicks. 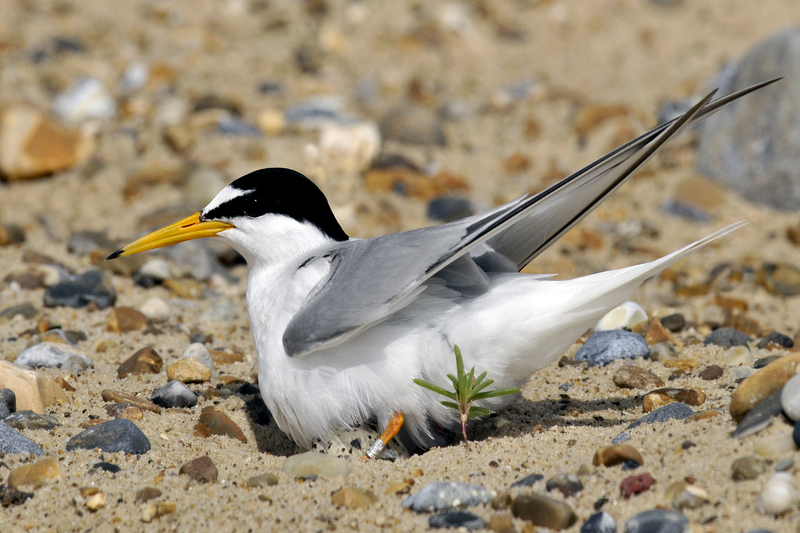 Due to human recreational disturbance on beaches, little terns are forced into fewer, larger colonies. This in turn, makes them an easier target for predators such as foxes, badgers, kestrels and carrion crow taking eggs and chicks. Adults are also predated, taking successful breeders out of the population. The adults will leave the nest if disturbed, leaving their eggs and chicks vulnerable to the cold and predators. Human activities and dogs cause disturbance if they come too close to nesting areas. This map shows indicates where you can see Little terns in the UK. We ask you to respect the little terns and follow any directions and signage near the colonies. If you see a little tern warden or ranger they will be happy to tell you all about little terns. Look out for fenced or roped off areas on the beach and please keep your distance from these refuge areas. Please keep your dogs under close control, we ask that you have them on a short lead. Keep an eye out for signs. These will show you the best routes to help leave the wildlife undisturbed. If you see a little tern trying to nest, don’t approach! Let a warden know where it is so we can help protect it. Take care when walking on the shingle: there may be nests with camouflaged eggs. If you see one, keep well away and contact a warden so we can protect it. Ringed plovers also try to nest on our beaches - they don't nest in colonies, although they will nest among little terns where they can get more protection. They suffer from disturbance. Watch the video to learn more.